Why is it that being really good at martial arts gives you the ability to pretty much fly? 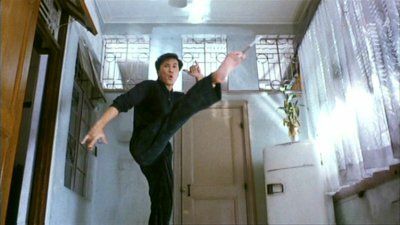 I feel we accept a lot from our old-school wire-fu films, one of those things being people just bounce around, have fights in mid-air, and so on. It’s one of the things that seemed cool as a kid and now seems a bit odd, but enough of my prejudices. I will now give a recap of this film, both to show the plot doesn’t really matter in kung-fu films, and also to demonstrate how even if it did matter, it makes absolutely no sense. A guy called Joe, a girl called…nope, can’t remember, but she was played by Maggie Cheung, lovely lovely Maggie Cheung…and another girl called Queenie, are orphans, raised by a man whose name is, I believe, Snooker. Snooker! 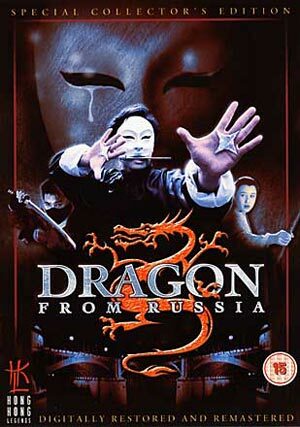 They live in Russia, but for some reason are forced to get on a train to go to Hong Kong; the train is raided by some badass masked killer types who kidnap Joe, take him to a guy’s dojo out in the middle of nowhere and train him to be an assassin. While doing his assassin-y thing, he keeps running into Ms Cheung, his former girlfriend, but as he’s lost his memory he’s got no idea who she is. Then the trainer’s other assassins and him get in a fight, I think, and the police are tracking Joe down, and there’s some other people after him as well, and who want the assassin school shut down (understandably). Joe has to go and confront his old trainer, rescue his girlfriend (who seems to get shot in the middle of the film and dies, but that must just be someone who looks a lot like her, who had the same woman dubbing her voice). Admittedly, I wasn’t paying the closest attention, and it’s a pretty well-regarded film in some circles, but I couldn’t make head nor tail of it. And the worst thing is, fight scenes have moved on. Back in 1990, this was certainly state-of-the-art, but we’ve had the good fortune of fighting movies becoming big business since then, and martial arts films have come on in leaps and bounds. Nothing really looks like it hurts in this film – every punch and kick is laughed off, and people barely ever have a scratch on them after a huge fight to the death. I might be misrepresenting the culture of this sort of film, and I’m sure afficionados would look down their nose at the new crop of fighting movies coming out of Eastern Europe. But to a film-literate outsider such as me, this looks like the product of a very different time. There’s stuff like the 20 minutes of weird knockabout comedy as he trains with his new master – an extremely evil man who plans assassinations for a living, lest we forget – and the way that the women in this film all look…and please don’t take this the wrong way, dear reader…very alike, to the point where I could identify Maggie Cheung, just about, and the main villainess, but everyone else might as well have been one character (and may well have been). The reason you’re likely to have heard of this film is due to it being sold in the UK as a box set with “City Hunter”, the Jackie Chan classic, and “The Story of Ricky”, perhaps the most insanely over-the-top film ever made. Compared to those two, this sadly pales in comparison, and unless you’re in a really good mood, I’d suggest going elsewhere. 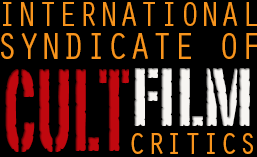 This entry was posted in Reviews, Youtube Film Club and tagged kung fu, Maggie Cheung, martial arts, martial arts films. Bookmark the permalink.